Valencia CF officially started the new season few days ago when it faced AS Monaco at the Mestalla for the Champions league group qualification match, in which the team won 3-1 and is heading to the second leg of that series with a solid lead. Hopefully that win gave the team enough of a confidence and moral boost to start the new Spanish league season on a positive note as well, away from home against Rayo Vallecano. Last season Rayo Vallecano were a mid table team, they finished 11th in the table in what was an average season for them. Valencia CF had to face them 4 times last season, in fact 3 matches against them in a span of 2 weeks. 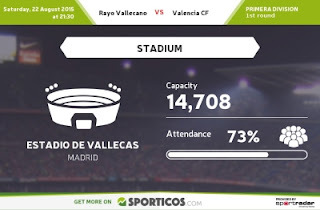 The first match played in Copa Del Rey Valencia CF barely won 2-1, away from home, while the second match in La Liga Valencia CF won convincingly 3-0 over Rayo Vallencao. Just days later both teams played a thriller that ended 4-4, with Valencia CF barely scraping on the aggregate past them to continue in the cup. Rayo Vallecano have had quite a lot of player flow this summer transfer window, with lots of players coming for free or on loan and basically over 10 players leaving from last season who were on loan there from various clubs. No significant names have arrived or departures though and since there has been so many changes to their team from last season, its hard to know what to expect from them this season. Valencia CF were not particularly busy this transfer window, Valencia CF did most of its transfer business last summer with major arrivals and this season they sort of had to make it official and actually sign the players from the loan type deals we had them on. Technically only 4 new players arrived, all of whom are young talented players, players for the future, though none of them particularly ready to instantly help the team, so Nuno is going to count mostly on last season's squad and home that some of the players who did misfire like Negredo, De Paul, Feghouli will improve and contribute more and on a more consistent basis. Line-up: Ryan; Barragan, Mustafi, Vezo, Orban; Fuego, Enzo; De Paul, Moreno, Paco, Piatti. Tactics: Low defensive line, own third pressure, mixed passing, counter attacks.